Some people say the “bacon craze” should have jumped the shark a while ago, but those people 1) are idiots, 2) ARE IDIOTS, or 3) IDDDDIOTTTTTTS. 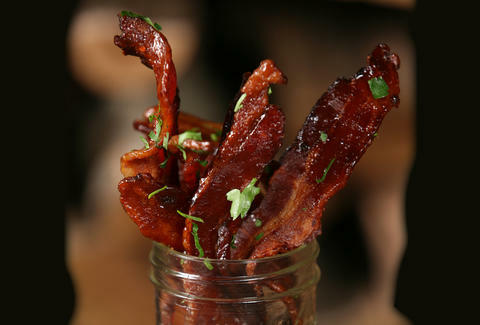 Since you're clearly not, though, you get this: the 13 best bacon dishes in LA. It's not just any bacon: this bucket (available at Silverlake's welcome new entry into LA’s growing BBQ rolodex) is actually a mason jar packed with long strips of brown sugar- and chili flake-coated bacon that has been baked and then flash-fried to crispy perfection. If you mention that you’re heading to this super-friendly neighborhood favorite to anyone who has been there before, the first words out of their mouth are bound to be “Crack Bacon,” usually followed by “Trust me.” And you should. A killer blend of spicy, salty, and sweet with a dusting of fresh herbs, Grub’s candy bacon goes well with any of the brunch, lunch, or dinner options (including The Kevin Bacon Breakfast). No doubt, the Animal dudes love their porcine products -- from ears to bellies to ribs -- but your trip to the altar of meatiness would not be complete without a final bow to the famed Bacon Chocolate Crunch Bar. A perennial favorite, this Kit-Kat-inspired slice of heaven features layers of hazelnut chocolate, peanut-studded chocolate ganache, and chocolate mousse, finished off with a generous crumble of crispy Nueske’s bacon and a side of salt and pepper ice cream. You may have rolled up to this barely-a-year-old SFV spot for its amazing oyster selection, braised short rib, and solid cocktail selection -- and that's totally fine, just make sure you add the crispy bacon toast to your "why I rolled up to this barely-a-year-old SFV spot" list. 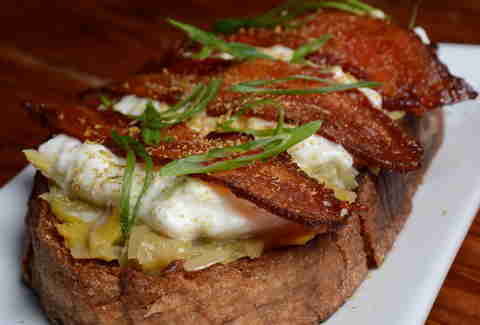 A foundation of thick-cut toast is topped with sautéed leeks, fresh burrata, a dusting of bee pollen, all presided over by three hefty slices of tender lovin’ bacon. Both Coolhaus' brick-and-mortar locations and roving trucks offer a lot of ridiculously clever ice cream options (chocolate-covered churro! Spiked coffee and donuts!! Fried chicken and waffles!!! ), which you can and will sandwich between two equally awesome cookies (peanut butter Cap'n Crunch! S'mores!! Nutella!!!). 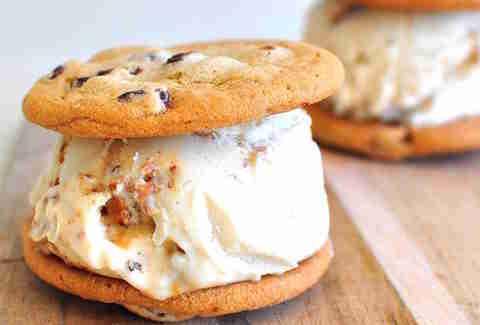 But the one flavor-must is the one that helped put them on the frozen treats map: the sweet/savory combo of brown buttered candied bacon ice cream, which features a brown butter base studded with big chunks of sweet, sweet Applegate bacon. This Downtown haven for comfort fare serves up a serious selection of homemade desserts, but the one that sells out the quickest? 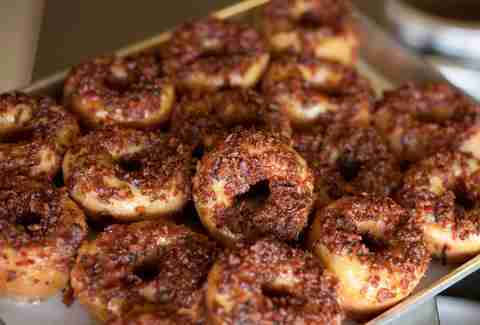 This brilliant combination of maple-glazed donuts and crunchy bacon flakes. You’ve likely seen imitators, but none quite measure up to this instant classic original. For too long, you had to chase down the Bacon MANia food truck around the OC if you wanted some of its pork-on-pork action, but now that it's opened up a storefront in Huntington Beach, you chase no more. 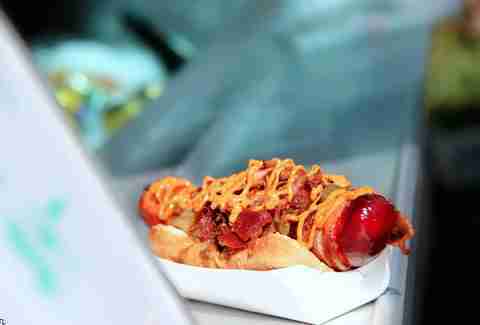 Be sure to order up the KC Dog: a bacon-wrapped hot dog, topped with pulled pork, crumbled bacon (Double Bacon Bonus, +2pts), pickles, and BBQ sauce. There are a lot of tasty directions you can go on the ever-evolving menu of David LeFevre’s M.B. 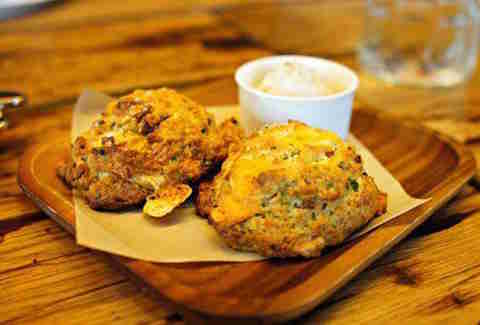 favorite (which includes plenty of killer porky options), but your first direction has to be toward the top of the menu and his signature bacon cheddar biscuits. The perfect balance of meaty-cheesy-buttery magic, these fluffy bad boys feature crispy Nueske’s bacon from LeFevre’s home state of Wisconsin, and come with a side of maple butter, which you should use generously. 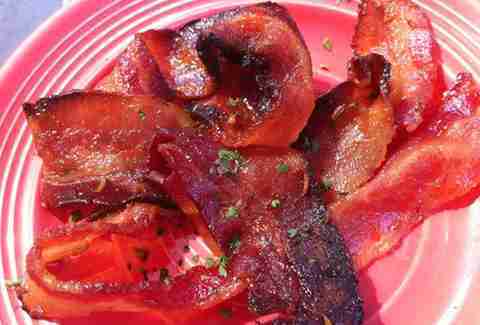 Oh, do you also want a side of that bacon that has been candied with rosemary, brown sugar, and chili? Yes, yes, you do. There are a lot of delicious reasons to hit this bring-a-date-charming Atwater spot, but the massively thick, house-cured bacon is one that you can’t afford to ignore. Throw that crisp, smoky goodness in the braised leek tartine with fried eggs at brunch and you’re ready to tackle the rest of the weekend. There are tons of fantastic BLTs around town that we would gladly devour (and do), but this always-reliable brunch and lunch spot takes the classic to the next bacon-y level. 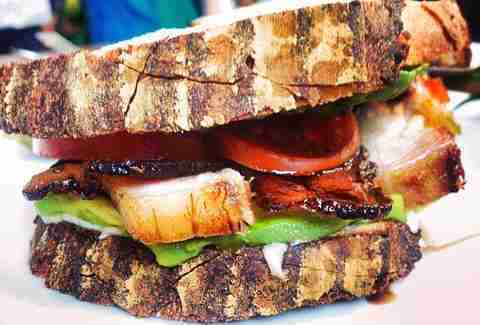 Here you'll be hit with a double dose, with crispy slices of Applewood bacon AND thick cuts of braised pork belly, all skillfully balanced by butter lettuce, fresh tomatoes, avocado, mayo, and fluffy country bread. Bring. It. On. This artisan-centric upscale joint crushes brunch on the regular and turns out some mighty fine fried chicken, but it’s an understated breakfast treat that leaves many craving a return visit. Probably not suitable for the Queen’s high tea service (unless she’s cooler than we think), the bacon cheddar scone features applewood-smoked dry-cured bacon from the lauded Zoe’s Meats in Petaluma, plus aged smoked cheddar from Fiscalini Farms. 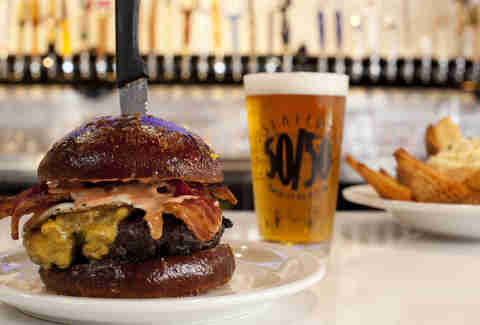 While we’ve obviously steered clear of LA's many excellent bacon-topped burgers for this list -- as they were more burger than bacon -- the B’B’B’ Burger at Slater’s is the pork-centric exception. Packed with more bacon than a Footloose marathon, this monster features Slater's signature half-bacon/half-burger patty, piled high with bacon American cheese, sunny side-up bacon egg, bacon-Island dressing, bacon ketchup, and, what’s that other thing... oh yeah, bacon. 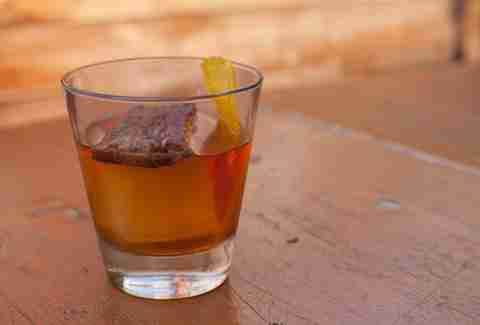 Whiskey and bacon in the same glass? Thank you Umami gods. It may come as no surprise that the smoky wonders of bacon pair well with bourbon, and thankfully you can sip those savory pleasures at the Umami on Broadway. There, the maple bacon Old Fashioned features bacon-washed Evan Williams, maple syrup, and orange bitters, plus it's topped with a thick slice of house-made, candied bacon. Danny Jensen is a regular Thrillist contributor and would like to thank all the bacon for his achievements thus far in life. You can find him dry curing on Twitter and Instagram.